If you performed the activity on the account, you will not need to worry! If you did not perform these activities, you will want to take steps to ensure your account is secure. To start, you will want to consider changing your password. Steps to change your password can be located HERE. Another step to secure your account is enabling 2 Step-Verification. 2-Step Verification (also known as 2-Factor Authentication or 2FA) is an optional system in which you will be asked to provide a unique code that is randomly generated once every 30 seconds via an application on your phone. This can come in a few forms from an e-mail to text messages or, in our case, an authenticator app for your smartphone. This means that, should someone ever manage to get hold of your account information and try to access your account with it, they will be asked for this code as well and without your phone, they won't be able to receive the code. We highly recommend enabling this option. Steps to do so can be located HERE. 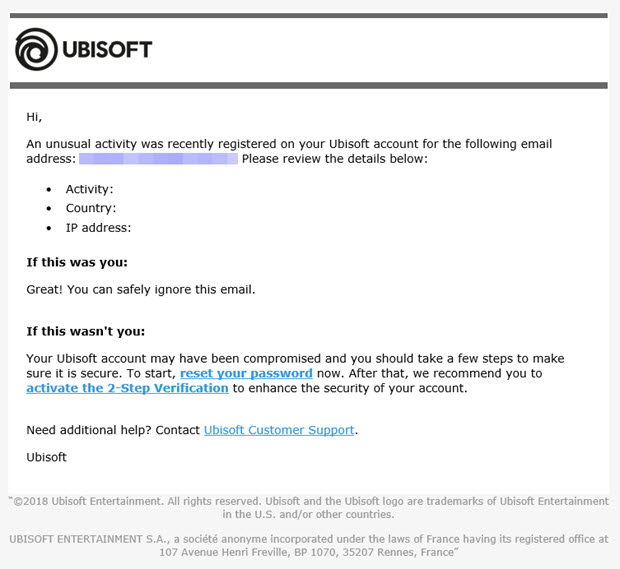 If you feel your email address has also been compromised, we recommend changing it. Instructions on how to do so can be viewed HERE.